One of just a handful of camera obscura that is open to the public in England. 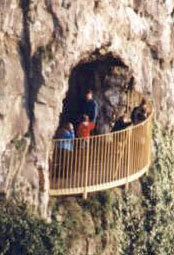 Features a natural cave reached from the observatory through a tunnel under the Downs. At the cave mouth, enjoy a spectacular view of the Clifton Suspension Bridge and Avon Gorge. The Clifton Observatory is situated on the Downs, near the Suspension Bridge. It was originally a snuff mill and was partially destroyed during a gale in 1777. The artist William West rented the old mill in 1828, to use as his studio. He installed the camera obscura, which is still in working order today. The camera projects a panoramic view of the surrounding area onto a white surface inside a darkened room. It works from a box on top of the building containing a convex lens and a sloping mirror. Light is then reflected vertically downward onto a table, giving a true image. This technique originated in the 16th Century and gives the best results on bright days. St Vincent’s Cave is also known as the Giant’s Cave and is 250 feet above the valley floor. The underground passage to St Vincent’s cave was cut out by William West. Originally the only access was via the cliff face. The cave is said to have been connected with the ancient chapel of St Vincent, as some pieces of carved masonry were discovered in the cave. This chapel is presumed to have broken away from the cliff and disappeared into the gorge beneath.